NYC Unions are rather well equipped. 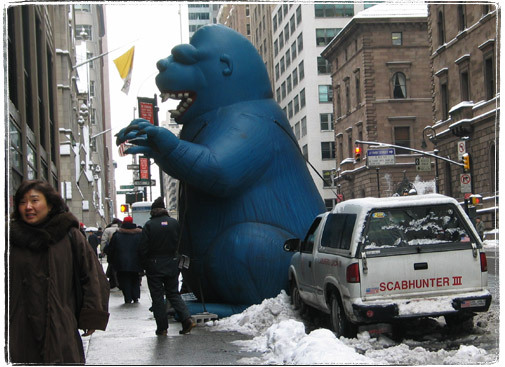 For instance they have this gigantic blowup rat that they use in demonstrations. It’s blue, it looks more like King Kong, but it’s a rat. It has a tail. Judging by it’s looks it gets a lot of use. The strikers usually stand near the rat, dance, sing songs and chant “Scab! Scab!” at people who enter the building. When the morning rush is over they probably head to a coffee and donut place leaving a few people to guard the rat.